The Fusion sit-on-top is about having a real fun kayak. 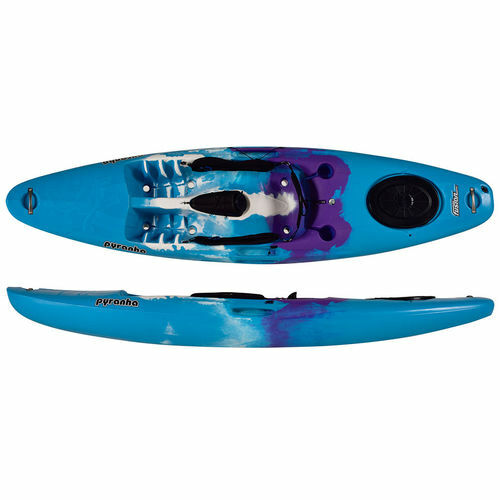 Paddle down a wild river, cruise flat water or paddle and surf waves with ease. The Fusion SOT is a boat that you can jump on and have a blast right away, no matter if you are a complete beginner or seriously experienced. The new Fusion SOT combines the forgiving hull of the proven Fusion crossover kayak with an open design that will appeal to paddlers who prefer the simplicity of a sit-on-top. The Fusion SOT has a stable nimble hull that runs rivers and surfs waves with ease. Drop the skeg and you can cruise flatwater sections or quiet backwaters. Deluxe spec comes with a top end WW backrest, thigh-straps, and Pyranha's leading retractable and tough skeg and hatch which provides plenty of room for overnights and exploration. Standard spec comes with thigh-straps and hatch. Optional Storage Pod for quick access to essential gear and snacks.